But what can I say, we all love a good reporting challenge. After I finished, my client was really happy, and he told me that they had been unable to find how to query financial dat. Upon hearing this, I realized that this would make an excellent subject for a blog post. After all, everyone loves financial reporting. 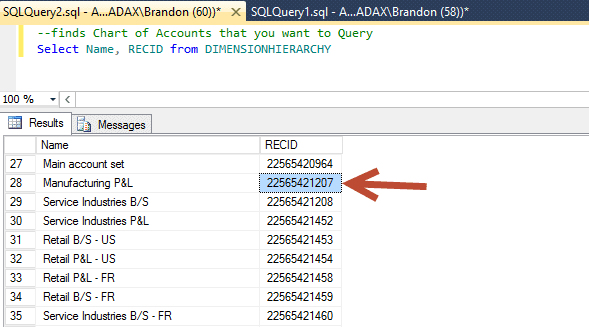 So, let’s use the Dynamics AX 2012R2 CU7 Contoso machine to show how to query financial data an produce it for reports or data loads or powerpivot or anything else with just plain old SQL. Now, let’s add some complexity here. In some cases, a dimension can be filled in and in other cases, it won’t be filled in. 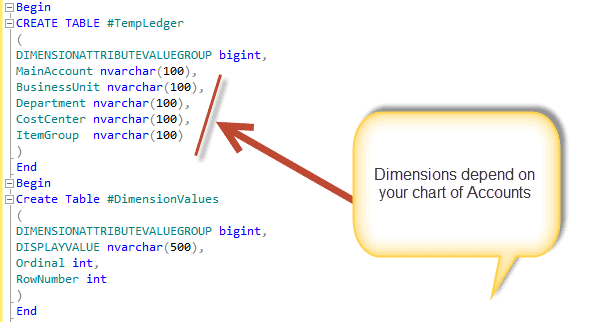 Plus, the dimension can have varying string length making it look to be a very difficult SQL statements as the string functions don’t readily quite deal with this situation. And we still haven’t found the tables that we need. Good, so now we know that the RecID is 22565421207 which will identify our chart of accounts in other tables as you will soon see. Okay, so in Part 1, you got everything ready. You understood how to get the chart of Accounts and you all setup two helper temp tables. Pay attention to the strategy as this will come to pay major dividends. In part 2, we will populate those helper temp tables by using the Dynamics AX financial schema. See you soon.